If asked to state my favorite artistic movement, I would say it is Impressionism. I enjoy how the impressionists capture light in their paintings. Impressionists defined a new way of seeing the world. Those artists depicted short bursts of daily life in an era just before photography become popular for the masses. There are many impressionist paintings I enjoy. One of my favorites is this scene from Renoir. 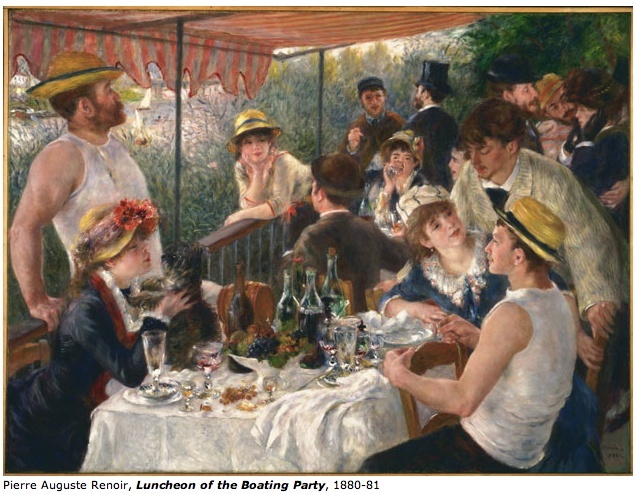 His Luncheon of the Boating Party is arguably his best known work. In a sharp segue on life imitating art, I want to mention a few thoughts about social impressions. There is an old cliché that states “You never get a second chance to make a first impression”. It is a slightly humorous way to stress the importance of making a accurate reflection of who you are right away. As with most cliches, there is a bit of truth embedded in this. To me, impressions deal with how you present yourself to a new contact. Introductions are important in setting a correct impression. How introductions are conducted in a business or social setting quickly set the tone and level of interaction in a relationship. By this, I’m referring to how formal or informal the introduction is. Your tone of voice, demeanor and posture all contribute to the impression you make. What I have found is that over time, impressions contribute to your reputation such that it is fairly accurate reflection of who you are as a person. When I meet people at work or at network events, I state my name, shake hands firmly and make eye contact. I try to ask questions that demonstrate that I am listening and my interest or experience on a given topic. Recently, I have found that impressions can also be a very powerful force in behavior. Combined with reputation and assumptions, impressions shape how you are perceived. I also think that behavior speaks louder than words and what you do is more important than what you say. While you can’t change impressions, your behavior can add or detract from your reputation. How do you handle first impressions? Do you always make the impression you want? If you had the chance to make a second impression, would you take it? I am currently reading a book about how we think. The recently published book is titled “Thinking, Fast and Slow” and was written by Daniel Kahneman, winner of the Nobel Prize in Economics. From the book, I want to illustrate what psychologists call ‘System 1‘ and ‘System 2‘. These two systems control our thoughts and reactions in ways I find very interesting. System 1 – Fast. Automatic, intuitive and quick with little or no effort and no sense of voluntary control. Detects simple relations. If we are uncomfortable and unhappy, we lose touch with our intuition. Detect that one object is more distant than the other. System 2 – Slow. Follows rules. Deals with the mental activities that demand attention. Performs complex computations and is associated with subjective experience. Monitor and control the thoughts and actions that are suggested by System 1. Allows some of those to be expressed in behavior and suppresses or modifies others. A baseball and bat together cost $1.10. Instantly, you think of a number. As Kahneman writes, “The number, of course, is 10… The distinctive mark of this puzzle is that it evokes an answer that is intuitive, appealing and wrong.” This is System 1 in action. With a bit of effort, System 2 shows what the answer is. The ball cost $.05. If you were able to resist the intuitive response, you determined the correct answer. System 2 is lazy. It can work out an answer but defers to System 1. The book expands on how each system works and their interactions. Other topics Kahneman cover include biases, choices and overconfidence. I’m still reading, and learning from, this book. I look forward to further insight about our thought process and how it influences our choices. As I can, I will share other learnings on topics along with my thoughts in a future post. Behaviorial studies prove we have a natural tendency to avoid risk. I want to refer again to Malcolm Gladwell and present the following scenario. You have $300.00 and are presented with 2 choices. B) Toss a coin and if you win, you get $200.00. If you lose, you get nothing. Most people prefer A. They tend to go for the sure thing and avoid the 50% risk of getting nothing. Even though there is the potential to get 2X if you win. Now consider this scenario. You now have $500.00 and have 2 choices. D) toss a coin and pay $200.00 if you lose. If you win, you pay nothing. Assessing the severity of a risk happening (or, not happening) is a key skill for project managers. When evaluating a risk on a project, be aware of the bias to gamble on the loss rather than the gain. We look for ways to mitigate risks. When a risk does happen, it creates chaos, can jeopardize a project and requires additional work to resolve. Communicating with your team, stakeholders and client(s) is crucial during this time. As a project manager, you must identify and define potential solutions (among them – do nothing). Some events are ‘acceptable risks’. Typically, the sponsor(s) and stakeholders will determine what is or is not acceptable. Depending on the situation and the client, they may also determine what is acceptable. Have you noticed how you are risk averse? 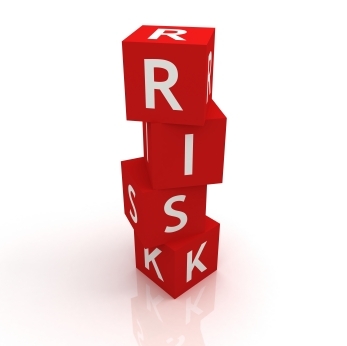 What are effective risk management strategies you use? Posted by Edwin Ritter in Behavior, Grab Bag, Trends. We live in a less than perfect world and not everything goes as planned. Things can, and do, go wrong despite your best intentions. How you deal with those situations and your resulting behavior says a lot about you. Inner strength, coping, values – those things that allow you to steer a path forward. So I find it wonderful to see how the Japanese react to the recent tsumai and the nuclear reactor leak. I want to focus on the positive here. How they help each other, are orderly and organized. No riots, no looting, many individuals willing to help others. I even heard that those who lost everything are now volunteers working in the radio active waste. Sacrifice for the greater good. Their behavior under very stressful conditions is a testament to their strength, values and will enable them to move forward. Japan will rebuild from this event. The Japanese will remember this event and continue forward. While I sit here in comfort, surrounded by those near and dear to me, it makes me appreciate all that I have. I am humbled by the positive I see in Japan. We should all behave so well under stress. While writing my last post on changes in social behavior, I found these other charts on social media and I wanted to share them. 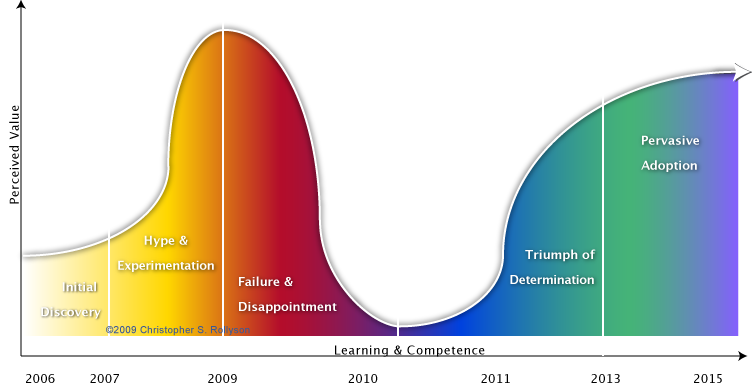 This chart shows a phased transition in social media behavior. The mindshift milestones are accurate as a key enabler for the next phase. 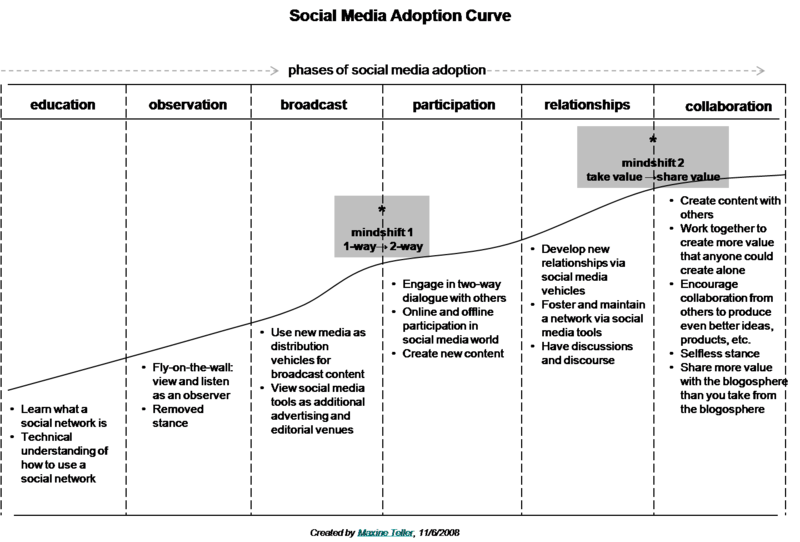 For me, overall these phases are related to the Forrester behavior ladder with level of engagement I mentioned in my previous post. I hope you find this useful and they provide you with some insights as we continue on this social journey. Watching the evolution of behaviors in social media is always interesting and provides valuable insights. Back in 2007, when social media really started to take off, I came across this chart from Forrester that describes the various behavior segments. Visually, it provides a quick self-identification of where you are on the behavior ladder in terms of involvement with social media. The segments remain viable and Forrester recently indicated our behavior segments are changing with a rise in joiners along with a plateau in creators. Joiners will continue to look for ways to share and keep up with peers. Expect tools to make this easier still and marketing efforts should continue to focus on social networking next year and beyond. We have several data points now with these segments and Forrester will continue to monitor and update us on the behaviors going forward. If you have access to their latest chart, please post. My behavior has changed and continues to evolve. I find it varies based on what topic is top of mind at any point in time. In the end, we are all consumers. What part of the ladder are you on and how has your behavior changed? Will you consume more and create less? 1) I added some additional charts available here on behaviors. Hope you enjoy them. 2) I looked back at the original article from Forrester in 2007 and noticed it was written by Charlene Li – no wonder I liked the article. 3) Links to both the original article and the related update on current behavior. Everything done on the web is a revelation. All the sites we visit and what we do there, reveals something. Sometimes we do it willingly, sometimes not. Even when we are part of the anonymous rabble and rolled into a trend aggregate, we still reveal something demographically. The web today requires that we do this. Social Media interactions is all about providing data about you. Getting engaged and involved within the viral community means sharing, communicating various bits and pieces about you. Change is inevitable; *growth* is optional. Each one a priceless pearl and an attempt to reveal something of import in a brief verse. Kind like a early, yet, static tweet. Adding a thoughtful message goes beyond email. It extends to Social Media also. Your digital profile on Twitter, Facebook or LinkedIn may be the same. Or, it may be intentionally different. You can choose a multi-faceted presence and each one reveals something about you. Our persona can vary based on who we interact with and what we want to reveal about ourselves.What does your email signature say? Do you use humor or present a strictly professional message? Do you reference something from your past with family and friends? For myself, the biggest revelation is to be consistent both on-line and in the real world. Are you surprised or did you know that already?